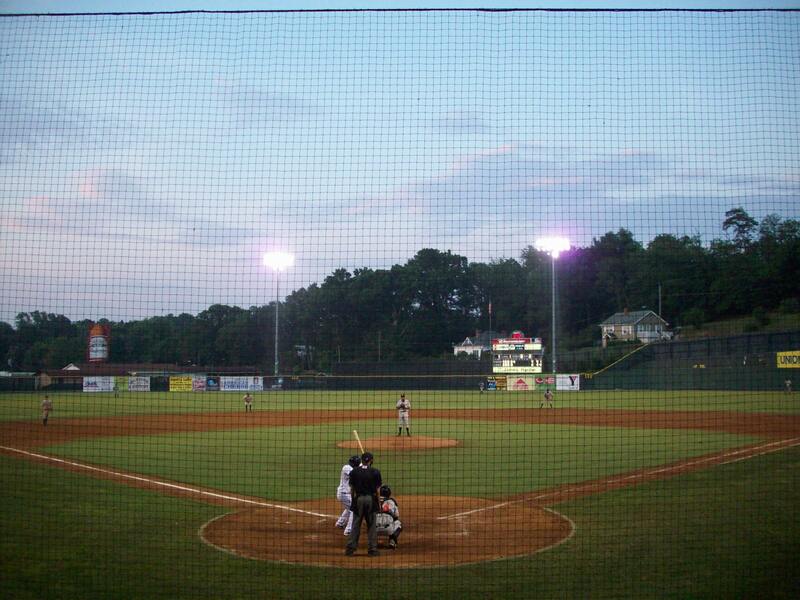 Ballpark Basics: Historic Park that’s lost its charm. 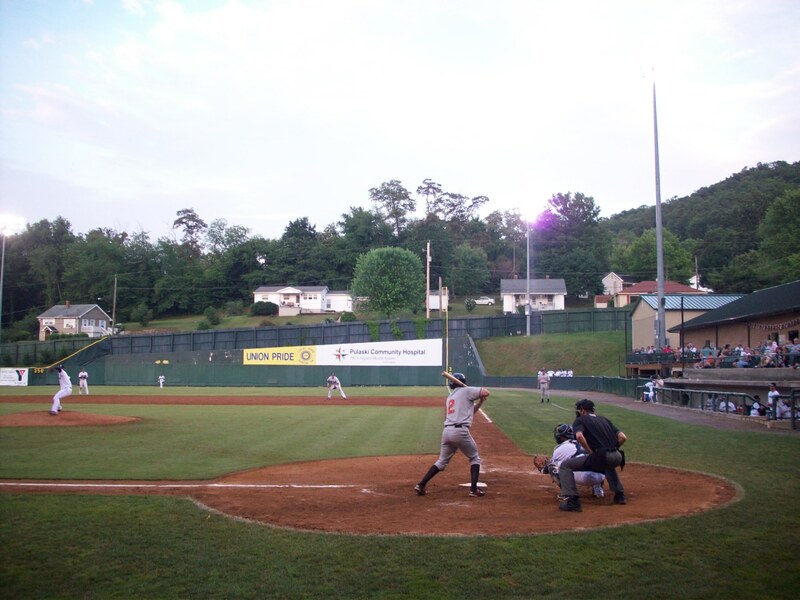 Ballpark Breakdown: Calfee Park is nestled in a hilltop neighborhood in Pulaski, Virginia. Built in 1935, as a Works Progress Administration project and named after the mayor of Pulaski at the time, Earnest W. Calfee. The park was something to see back in its heyday because they have a great following and crowd energy, and while today’s fans remain devoted, the park itself shows very little of its original charm. 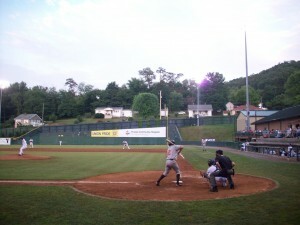 In fact the only remaining pieces of the old park are the grandstand along the third base side, and the original ticket booth and large stone entrance which are located in the left field corner. This is probably the coolest part of the park, but you have to go find it since the new main entrance is on the first base side. The ballpark went through a major renovation in 1999 with new seating behind the backstop and down the first base side, a new press box, concession stand, and three rows of seats surround the infield. The grandstand along third base is the family section and they have removed all of the seats (and with this renovation, most of the park’s appeal as well). What remains are the large concretes steps on which the seats used to be in, but now people bring their own chairs to watch the game. 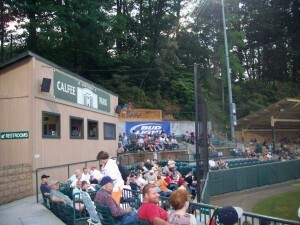 Similar to Kinston, Calfee Park has “box seating” that is essentially roped off sections along the first base side with folding chairs. The press box is a rudimentary building that looks like a shed built from the local Home Depot. There are actually two concession stands; one for drinks and snacks and another one for hamburgers, hot dogs and grilled items. Yet even with all of these alterations, the park is listed on the National Historic Register. One of the most unique features of the park is their own version of the Green Monster in right field. The distance down right field is only 301 feet but there is a 19 foot wall the towers over right field. Behind this wall there are a handful of houses that have a great view of every game. Another quirk of this field is found in the parking lot. Upon arrival, we actually had to make our own spot fairly far from the main gate, yet as we got closer, we realized a lot of the spots up front were available. Thinking it was a fluke, we shrugged it off, until the game started and we realized what the locals already knew – parking up front puts your car at the mercy of fly balls and home runs. So don’t park close. Want another “Game Day Tip”? Use the directions on the website to find the park. We plugged in the address given on the website into our GPS and ended up on a desolate road in downtown Pulaski before we saw a yard sign pointing us in the direction of the park. 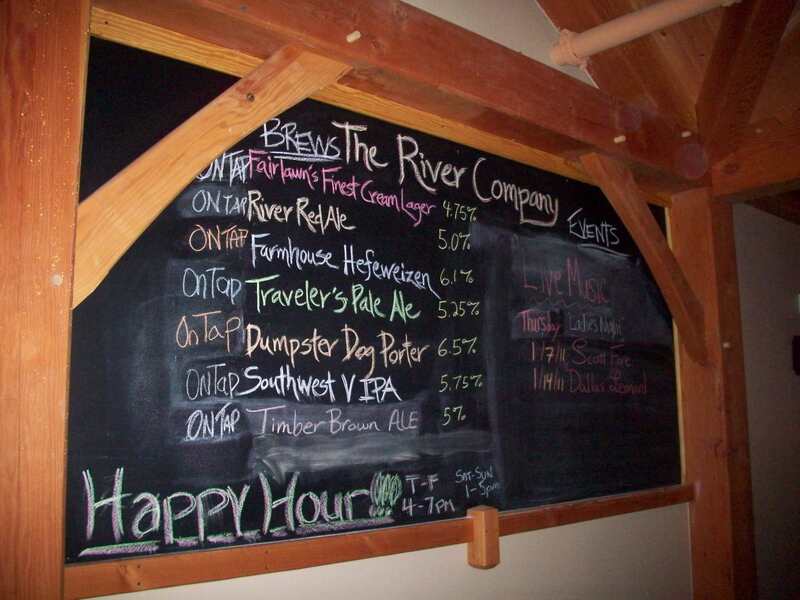 River Company Restaurant and Brewery Inc. Brew Basics: A ski lodge with unique beers and a hilltop view. Located on top a mountain near Radford University in southwest Virginia River Company Brewing is cabin-in-the-woods-esque, complete with two sided wood burning solid stone fire place and an exposed wood and stone ski chalet feel. The hand carved mantel and freshly fallen snow blanketing the city below certainly didn’t hurt either. 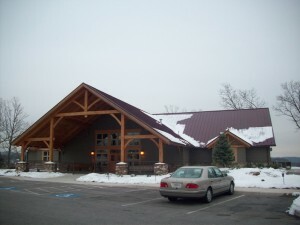 While the outside reminded us very much of Devil’s Backbone Brewing Company, the inside was a different story. You are greeted by a large entryway with an L shaped bar off to your left, and beyond the bar, sizeable windows looking down onto gleaming brew casks. The rest of the building is reserved for tables. While The River Company is basically a large and open room, the booths and tables are sectioned off and set up to give an illusion of privacy. Outside porch lights have been brought in as their main lighting, and cast a pretty, pale glow over the restaurant. They even put their “top of the hill” vantage point to good use with large picture windows, French doors and a considerable overlook deck open in the warmer months.The staff was friendly and fairly knowledgeable, the beer were reasonably priced, and if you’re up for it, we highly recommend the spinach and artichoke dip. They were completely out of their seasonals when we arrived mid-week in late December, but each of their usual draughts proved to be unique in their own right. It was difficult to choose a favorite (other than possibly the Dumpster Dog) for while there were definitely things to like about each beer, we didn’t find one that really stood out to us, and really enjoyed getting to taste and compare the different flavors as opposed to having to drink a whole pint of just one. As mentioned, we were pleased with the prices for both draft (3.75/pint) and tasters (1.00 for 4oz). Happy hour offers 2.50 pints from 4-7 weeknights 1-5 weekends. Fairlawn’s Finest Cream Lager – 4.75 ABV. Gillian liked this one, but Jim was on the fence. Fairlawn’s Finest was effervescent and light; similar in color to white grape juice, which is kind of what it tasted like as well. It has a sweet fruity fragrance and high degree of carbonation, all put together it was more like drinking sparkling wine than beer. This definitely needs to be your first brew of the evening because drinking anything heavier first will overpower this lager. Farmhouse Hefeweizen – 6.1 ABV. Three types of malts and two types of hops go into this recipe, and produce a beer that is very wheaty, light but cloudy with citrus notes and a pronounced orange tang. Not much to say about this one, they nailed it, and if you like this style of beer, you’ll like the Farmhouse. River Red Ale – 5% ABV. The River Red is very lightly carbonated, well balanced and consistent; one you should roll around a bit in your mouth before swallowing. It has a deep caramel color and a faint aroma most reminiscent of honey and chocolate, and leaves you with a malty aftertaste. Timber Brown Ale ­– 5% ABV. This is a session beer, and one that is so woody that we had to smell it multiple times to be sure we were smelling the beer, and not catching whiffs from the fireplace. It’s really a straight wood aroma, but it’s even more so in taste. The flavor hits you right upfront and leaves a slightly smoky taste on the palate; unusual –and not a traditional brown, but absolutely unique, and worth trying. Travelers Pale Ale – 5.25 ABV. A great pale ale with light toffee color similar to apple juice with a strong, slightly sweet aroma, upfront bitterness, assertive hops throughout that tickle your tongue and a strong hopped finish. It lingers on your palate less than the IPA, but is more bitter and has absolutely no fruitiness. Dumpster Dog Porter – 6.5 ABV. This beer boasts seven different hops and a darkest chocolate color of any of the River Company beers. It’s smoky in a smoked wood, New England winter kind of way but the smokiness comes through more in the aroma and aftertaste, but is overpowered by the hops on your tongue, and certainly is not as pronounced as the woodiness of the Timber Brown. Southwest “V” IPA ­– 5.75 ABV. At first the smell is markedly fruity, which was unexpected in the IPA. The color is that of raw wood or mulled cider, and it has assertive hops similar to that in the Travelers Pale Ale, but the bitterness is offset by the citrus. Compared to the Travelers, it is lighter, and the flavor is more upfront, with little follow through.